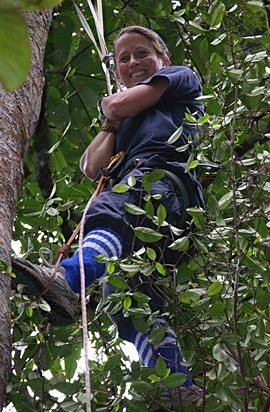 Erin Vogel climbed a few trees while shooting a segment for "Animal Planet." Photo by Jose Florez. Field work in Borneo can be hot, sweaty work. Just ask the Animal Planet crew that filmed anthropology's Erin Vogel for a program scheduled to air Tuesday, May 6. "It was definitely the hardest location that crew had shot," recalled Vogel, an associate researcher and lecturer in anthropology whose study of orangutans is the subject of the program. "The crew was amazing, but they really didn't like the mosquitoes and the heat. They had to get used to sweating through all of their clothes and always being wet." Part of a five-part series called "Raw Nature," the segment featuring Vogel focuses on the feeding behaviors of the great apes. Her research was featured in a story in Currents Online. The shoot was a first for Vogel. "It was really tiring, actually," she said. "At first I was a little nervous. I'd never been on camera before, so we had to do a lot of takes." Animal Planet flew Vogel to Borneo in January 2007 for the 10-day shoot, which took place at the remote research station where her fieldwork is based. The rustic accommodations weren't quite what the crew was used to, she noted.